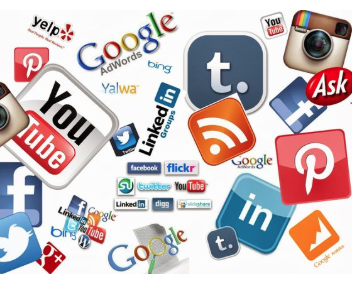 Using social media used to be a very complicated process in the past and seemed virtually nonexistent before the creation of Pinterest, Facebook, Twitter and LinkedIn. But as the social networks have multiplied so have techniques which are for using them effectively. Today, it’s a very important place to use to create social proof of your business. It’s a GREAT place to start posting those infographics! With a standard Facebook post and link for example you will see many little elements such as a designer URL, a special font, an engaging question in the beginning and a fitting picture. In recent times it seems just the social media is not enough you need to have right show and the right backdrop for the show in order to succeed. You can go all out and customize your social media channels with the perfect blend of graphics and advertisements. One way in which you can get some considerable use out of social media without even trying or hiring an expert to distribute your infographic across social media. Furthermore you can chart out your client base’s interests on the basis of the number of ‘likes’ and ‘retweets’ and also get information about demographics which will help you in product placement and so on. Uncovering emotional triggers is also of utmost importance if you are trying to sell a product which appeals to a certain age group or class. Have a personalized approach and feel free to ask people personal questions on social media because they will want to respond if they feel importance is being given to their lives and opinions. Make sure the questions are rather specific so that you can get the right kind of audience for your product or content. Opt for approaches that touch an emotional nerve and let the consumer reach out. Save money gimmicks are great for attracting attention as long your business is not a fraud (which may result in serious action). Uploading posts in the evening which is the primetime for most adults to be free from work or university can guarantee you the best response and audience. Time blocks like this make all the difference when you are trying to get noticed and trying for your product to get the publicity it deserves. Capitalization and changing up fonts has also been proven to be remarkably useful when using social media for publicizing. Remember, you created a very nice infographic. It’s a marketing piece you can push to thousands, if not hundreds of thousands of people. So go tell everyone about it!